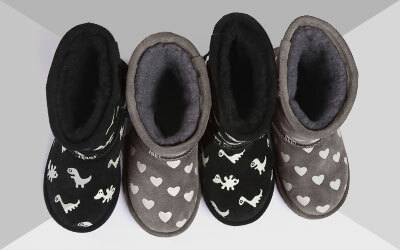 Delight the little ones with an EMU Australia shoe or boot from our Little Creatures range. They’re sure to love our cute selection of animal themed footwear for children. Our 100% real Australian sheepskin shoes and boots for babies, toddlers and older children come in a range of styles, including sneakers, booties, taller boots and ballerina pumps. Choose an animal boot from our ‘Walker’ range, ideal for new walkers as they have a flexible but durable outsole which allows for easy first steps. Go for classic colours like tan, black and brown with our Bear or Lion boot, or cute pops of colour with the Piggy in pink, Shark sneaker in blue or the Ladybird in red. Kids just love our Little Creatures range of shoes and boots for children. We’ve taken the best styles of our 100% real Australian sheepskin shoes and boots and added cute animal themed designs for the little ones. We have tall style sheepskin boots, shorter length booties, cool sneakers and pretty ballerina pumps. Whatever style you choose, you can be sure we don’t compromise on quality. The sheepskin and Australian Merino wool we use is really cosy and comfy, plus highly durable and long lasting, so they can keep up with the kids. Sheepskin is also water resistant and very breathable, meaning it keeps little feet warm in the winter but wicks away moisture so they stay cool in the summer. At EMU Australia we also use double stitching, and our soles are hard but flexible. We even have a range of Little Creatures ‘Walkers’ especially for new walkers, where the soles are designed with those early first steps in mind, as they have a wave design for added grip and traction. 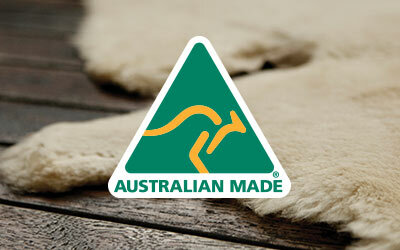 Many of our Little Creatures sheepskin shoes and boots are also Woolmark accredited.